I’m a little embarrassed to say that I’ve never heard of Delia Smith (English Cook/TV Presenter) prior to this Cook Like a Star bloghop event. And after browsing through her website deliaonline.com I’ve decided that I love this woman. Her recipes are simple, straight forward but attractive and nourishing at the same time. There are plenty of vegetarian options too which is right up my alley. As we go meatless at least 3-4 days a week nowadays, so it’s always good to discover more delicious recipes. 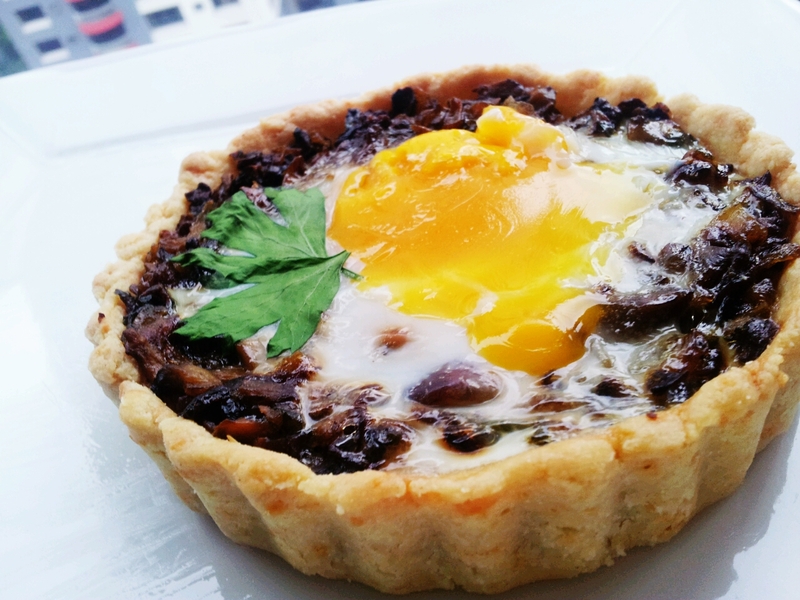 When I came across this Baked Egg and Mushroom Tartlets recipe on her website, I knew straight away I want to make it first. I’ve done baked eggs and made pastry many times separately but combining them is just brilliant! And who doesn’t love a good savoury tart? This one is rather special because the pastry is made with Parmesan cheese. Excited yet? Recipe from Delia Online with minor changes. Begin by placing the porcini in a bowl. Pour enough boiling water to cover them and leave to soak for 30 minutes. To make the pastry, place both flour, almond meal in a large bowl, rub the butter cubes into the flour and stirring in the Parmesan cheese with sufficient cold water (3-4 tablespoons) to mix to a firm dough. Flatten to disc, wrapped in cling film and leave in fridge for 30 minutes. To make the filling, heat 40g butter in a heavy-based frying pan, add the onions and garlic and fry until they are soft and almost transparent (about 15 minutes). While that’s happening, finely chop the fresh mushrooms. When the porcini have had their 30 minutes’ soaking, place a sieve over a bowl and strain them into it, pressing to release the extra moisture. You can reserve the soaking liquid and freeze it for stocks or sauces if you don’t want to throw it out.Then chop the porcini finely and transfer them with the other mushrooms to the pan containing the onions. Add the remaining 20g of butter, season and cook till the juices of the mushrooms run, then add the lemon juice and parsley. Raise the heat slightly and cook the mushrooms without a lid, stirring from time to time to prevent them sticking, until all the liquid has evaporated and the mixture is of a spreadable consistency. This will take about 25 minutes.While the mushrooms are cooking, pre-heat the oven to 200°C. Press the pastry into the mini tart pans (about 10cm in diameter) and gently push up the edge (with just 1-2mm above the edge to prevent shrinkage). Trim the edge and prick the base all over with a fork. Leave them in the freezer until you are ready to use. When ready to bake, place the tins on a baking tray and bake for 15-20 minutes until pastry is golden. Remove from oven and reduce temperature to 180°C. Divide the filling between the tarts, making a well in the centre with the back of a spoon. Then break an egg into a saucer or a small ramekin, slip it into the tart and scatter a little Parmesan over the top (I didn’t add the extra cheese). Repeat this process with the other tarts and return them to the oven for 10-15 minutes until they are just set and the yolks are still soft and creamy. Serve straight away, because if they wait around the eggs will go on cooking. Drizzle some truffle oil and garnish with fresh parsley and dig in! The verdict? I LOVED IT! The tart is crumbly, cheesy and aromatic, the mushroom mixture is rich, earthy with umanimess but with enough piquancy from the lemon and herb, while the velvety egg yolk just bring this to a whole new level. This is perfect for a weekend brunch (or anytime for me really), or a great starter for your dinner guests. Even the meat lover will love this. I promise. I did mention that I have a tart shell leftover and I was definitely not going to waste it. After rummaging my vegetable section in my fridge, I found an eggplant, half zucchini, half capsicum and tomatoes. 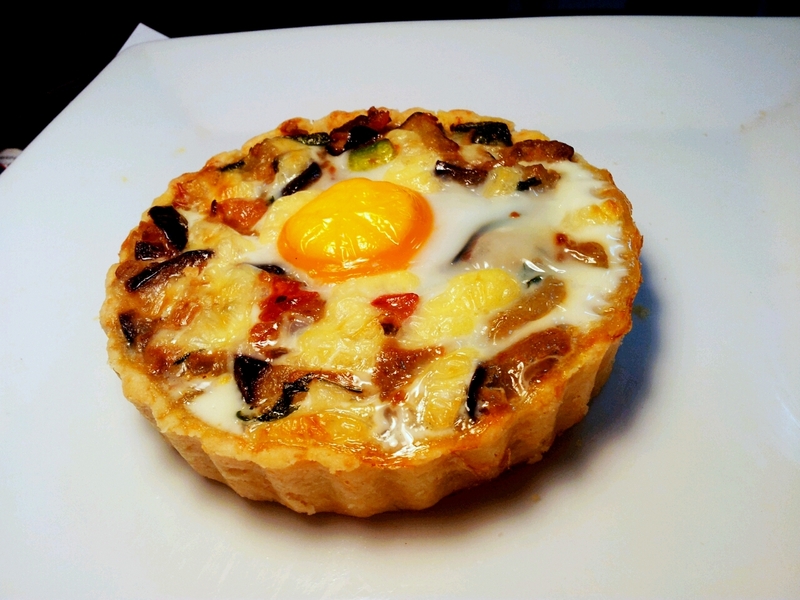 And so the Ratatouille Baked Egg Tart was born! Since some of you have requested for this recipe I’ll post it as well. For convenient sake I listed the ingredients enough for 2. You can easily double it for a full batch. Roughly chopped all the vegetables. Place the Eggplant and Zucchini pieces in a bowl and sprinkle with salt. Set aside for 15 minutes, rinse and pat dry. In a heavy pan heat some olive oil. Add onion and garlic and cook for 10-15 minutes until translucent. Add all vegetables and sauteed for another 10-15 minutes until eggplant is tender. Add chopped Parsley and mix well, turn off heat. Bake the tart shells as per previous recipe. Fill the tart shells with the vegetables, make a well in the centre and crack an egg in the centre. Sprinkle Cheese on top and bake for 10-15 minutes until Egg white is set (while Yolk is still runny). This is my favourite combination of vegetables and I’m glad they worked well in a tart. You’ll get your daily requirement of vegetables here. The Parmesan pastry is definitely here to stay. I am submitting this recipe to March 2013’s ‘Cook Like A Star’ blog hop hosted by Zoe at Bake for Happy Kids, Baby Sumo at Eat your Heart Out and Mich at Piece of Cake. See other amazing Delia recipes below! Also shared on Meatless Mondays, Recipe Box #38. I live your adhoc vegetable version too… Which do you prefer? Aiyo….the pictures are making me drool and drool. Gonna try this very soon. Shortcrust pastry is very easy to make, you should give it a go! You are welcome! Looking forward to see your creation! Ooooo…takes my breath away! You take orders? Slurpssss…..
Can take order but no delivery option wor. Hi Kelly, looks great!! Thanks for joining us in this bloghop, I think many ppl worldwide have no idea who Delia is although she is one of the most famous chefs in the UK!! Yeah when I was living in Melb I only paid attention to the chefs in Oz, not so much UK/US, that’s why the bloghop is wonderful for learning! 🙂 For eg. I think most people out of Australia don’t know who Curtis Stone is but he’s one of my favourites. Hehe. Yeah I couldn’t wait to dig in. Wow! 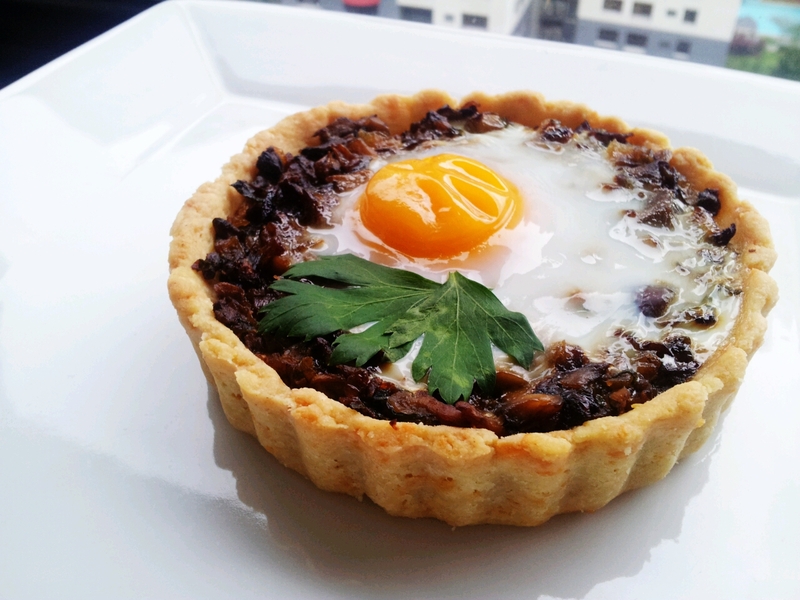 That baked egg in mushroom tartlet looks so delicious!! Yum! They were indeed very delicious! Please don’t be embarrassed… prior this event, I have never heard of Delia Smith too :p Nice to know this big name from Yen… Delia’s no nonsense recipes are always fantastic and these mushroom tartlets seem no exceptions. Oh I’m not the only one hehe. My bf was shocked that I’ve never heard about her (well he is from that side of the world anyhow). Hehe. Hi Kelly, haven’t visited your blog for such a long time, you still look very pretty, or prettier, haha! Thanks for your messages on my blog! This is a very pretty looking tart, must also taste delicious too! Thank you, I think I look the same la. 🙂 The tarts are indeed tasty. Hi Kelly, this was one the recipes I was eyeing! Looks delicious. You should make it then! Really delicious. Awww so are your recipes! Ooh. Your Instagram pics makes me hungry 99% of the time. Both versions looked every inch delectable!! let’s see if I got the time to make these babies…. the tart must be good with the cheese incorporated in. The egg makes the tart look so much more irresistible! even the ratatouille tart sounds good to me ! Oh yum! The mushroom filling alone has won me over!!!! Reminds me of Mr Tulk’s mushroom side dish for brunch! This is a starring recipe. It looks beautiful and I can only imagine how good it is. It is being featured on Recipe Box and it deserves that. Thanks for linking up. Thank you so much Chaya for the feature!! amazing blog you have here, thank you for sharing it!